18/02/18 New fault: ZX with white screen. ULA is broken so I'm not be able to repair it. 19/01/2018 New rom dump of Copiasoft made by JGComponetes because the old one was incorrect. Thanks to Stuart Brady. 28/10/17 The schematic of Multiface 3 clone made by Hard Micro has been updated with R1, R2 and C1 values. Thanks to Viktors Lisenkovs. 13/07/16 New interface: First version of Transtape 3 made by Hard Micro. Thanks to Dandare, Floppy and ElfoOscuro. 06/07/16 PCB Photo of TK90X issue A that was sold in Uruguay. It has ZX Spectrum ULA. Computers seccion.Thanks to Mario Hernández. 06/04/16 New Fault: Silver Timex Computer 2068. At power up, the timex showed black screen. With the scope, I detected that there were no activity in most Z-80 pins. Changed Z-80 and the problem is solved. 20/02/16 Photo of a ZX Spectrum 48K issue 5. Computers seccion.Thanks to Carlos Lafonte. 01/10/15 New interface: Joy III made by JG Componentes (Portugal). Others interfaces seccion. Spectrum+128K issue 2.0.It always showed the same image. Using a interface with its own rom, the spectrum worked well.Changed original EPROM with a new one. Spectrum +2.Erratic behavior. Sometimes it worked but most times it didn't. Sometimes it tried to start in 48K mode. Memory tests gave messages of upper RAM banks fault but It can not identify the damaged chip. Unsolder several chips until find damaged IC22 chip. 31/05/15 New Spectrum Fault: Timex Sinclair 2068 with several faults. 1) No power. I open it and detect that +5v power supply only gives +3v. There are 2 RAM chips 4416 that warm a lot. I desolder these 2 RAM chips and TS2068 gives +5v. 2) No TV image. No +12v. Changed 78L12 regulator. 3) It still doesn't start. I desolder and test the rest of RAM chips. There were 2 more broken. Finally I changed 4 RAM chips 4416. 30/04/15 New interface: Centronics-RS232 made by MHT ingenieros. This interface is the same as Centronics-RS232 Indescomp that was distributed by indescomp and manufactered by MHT. Thanks to Sinclair200. 31/01/15 New interface: Tv Sound Adapter made by Sono. I couldn't make the scheme because the PCB is covered with resin. Other interfaces seccion. Thanks to José Manuel. 25/01/15 New interface: DEFCON made by Ocio ZX. Thanks to José Manuel. 06/01/15 New Spectrum Fault: Spectrum +128K issue 2.1. This spectrum had a important reparation. The cables came loose and caused a short circuit. - The screen didn't change after press reset. z-80 faulty. - The screen change a bit but it was very similar. PCF1306P faulty. - Memory fault. Changed one 4164 chip. 29/11/14 New photo of an older Inves spectrum + board. Computers seccion. 03/11/14 Update the file about: Light pen Investronica/Inaxel with photos of original box (in bad conditions). 19/10/14 Corrects a small error in RBG pins of Peritel RGB interface. 31/08/14 Update the scheme of Sound&Joystick Interface . A little jumper near of volumen area allow to configure the PCB for 2732 EPROM instead original 2716. The first scheme didn't have this option. 20/08/14 New interface: AC DOS disk interface. Betadisk clon made by a Polish company p.z.apina . Other interfaces seccion. Thanks to Jaime (alt). Spectrum +2B issue 1. At start, the screen was black with white border. Sometime moving colours pixels appear. Changed ROM chip IC8. I put Spectrum +2B issue 1 photo in computers seccion. Multijoystick MHT. Scheme Eagle and ROM files. Multijoystick MHT con sonido. Scheme Eagle and ROM files. Multijoystick indescomp. Scheme Eagle and ROM files. Spectrum 48K issue 6.At start, the screen showed vertical black and white lines. There were also some pixels across the screen. With red border, there was a lot of noise. RAM test showed problems in low memory. I tested some chips but there were ok. I tested PCF1306P, ROM y Z-80 chips but there also were ok.Finally, I found that the scope showed some ac signal in the +12v. C44 capacitor was not working well. After C44 changed, Spectrum started well. 20/07/13 New interface: Centronics / RS232 interface made by Ventamatic. 07/07/13 New interface: Other version of joystick and mouse interface made by Investronica-FM&As. 1) No power on. 78S05 regulator fault. 2) No TV image. No +12v. TR9 transistor fault. Changed TR9 ZTX650. 3) Very bad RF image. Compositive video was OK. Modulator fault. Re-soldered the resistor that join PCB and RCA connector. 4) The cassette didn't work well. A broken plastic piece blocked it. I repaired the piece and also changed the belt. Spectrum +2B. The screen showed a completed black screen. Some RAM chip were very hot. - Ram memory fault. Changed all ram chips. - It still didn't work. Z-80 was fine. Rom A fault. Someone got out the rom and when he put it back, he bent a pin.I repaired the bent pin. DivIDE. Spectrum started like divIDE was not connected. GAL A fault. Electronica CIP03. Romanian spectrum 48k. It started with a black screen with some vertical lines.Touching RAM chips, the screen changes and showed a lot of colour blocks. RAM problem. Changed two 4164 chips. I put CIP03 photos in computers seccion. 12/11/12 New fault: Spectrum +48k issue 6. 1) At start the screen showed white, black and some red vertical lines. 2 4116 ram chips broken. 2) A spare 4116 ram chip burned, very noise screen, unstable voltages.Changed all electrolytic capacitors. 11/09/12 New interface: Microhobby joystick. Joytisck designed by magazine Microhobby and made by a hobbyist. Other interfaces seccion. Thanks to Juan Sanz. Joystick interface SPIJ I. Thanks to José Manuel Claros. Joystick interface SPIJ II.Thanks to NeilParsons. 21/04/12 New interface: Interface sinclair / Kempston. Like I don't know who made it, I've left the file in Other interfaces Seccion. Thanks to zx4ever. No power on. 78S40 (+5v line) and 78L12 (+12v line ) changed. It didn't start well. TS2068 can be modificated to change original ROM by EPROM.This TS2068 had this modifications but It still had ROMs. I remove this modifications and It works. Strange colours. Adjust VR2 and VR3 resistors. 18/10/11 New interface: Timex FDD 3000 disk interface. Other interfacesSeccion. 12/10/11 New fault: Timex FDD3 disk controller. At power on, the disk drive tries to read the TOS disk for a few seconds and stops. RAM chip problem that prevents the FDD3 boot correctly. This FDD3 has a 16K RAM board with 8 4116 RAM Chips. Changed a 4116 chip. 03/10/11 Update the file for Swift Disc interface. I fexed the scheme of this interface and also put the original instructions (thank to José Manuel). Other interfaces Seccion. 26/09/11 New interface: Twister board for Timex TS2068. Bruno Florindo send us information and photos of this interface that allow TS2068 computers use ZX Spectrum interfaces. Other interfaces Seccion. 06/09/11 New interface: Unipolbrit's FDD 3000. This is the Timex FDD 3000 sold in Poland. Other interfaces Seccion. 29/07/11 New interface: Interface Timex para el FDD3000 (II). It's has a complete different board.Other interfaces Seccion. 24/07/11 Update the file about Interface Timex for FDD3000. Now includes description and jed files for PAL16L8 "23" and "16-23" chips. 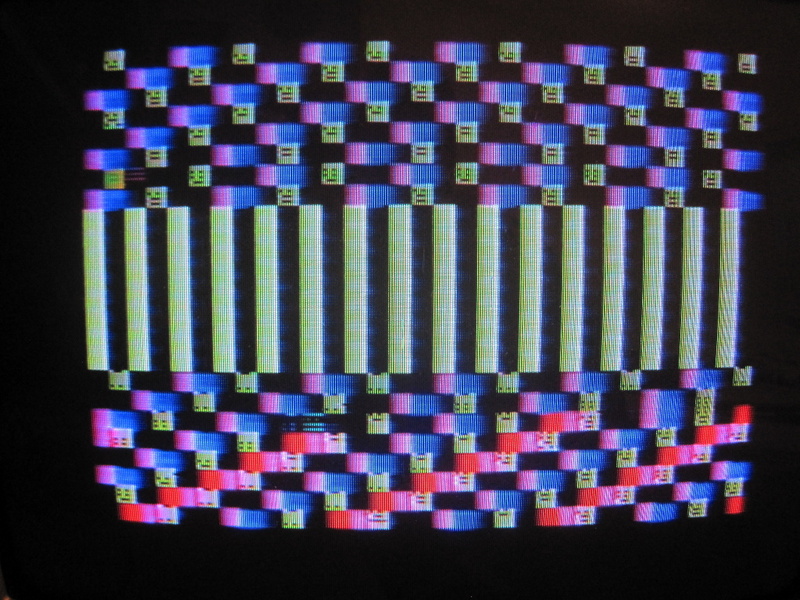 Spectrum 48K issue 3b: It starts well but when we load any game, Spectrum always gives "tape error loading" at the end. This happens with a cassette tape and using DIVIDE interface. This Spectrum was a 16K upgrade to 48K with 7 OKI 3732L-20 and a 3732H-20 chips. You can not mix H and L ram chips. Changed OKI3732H-20 with a 3732L-20 chip. Spectrum 48K issue 4s: It starts well but the screen show a pair of black pixels. Touching any key, the spectrum hangs showing a black stripe on the bottom of the screen. Some RAM memory test says it's okay. Z80, IC3, and IC4 chips are OK. I also check lower RAM. Lower memory fault. Changed IC13, 4116 chip with a new one. 16/01/11 Update the information about NMI Aktivator interface. Now, thanks to Miguel Angel Rodriguez, we know how this interface works at 100%. Other interface section. New photo: Pentagon 128K board. Computers section. 20/12/10 New interface: Peritel Zx Spectrum. Other interfaces Seccion. Spectrum 48K issue 2: Spectrum works but the screen is too yellow. It also shows a lot of interferences when spectrum warm up (ULA and 7805 warm up a lot in this spectrum model). Power connector doesn't make good contact and fails. TR4 burns during testing because of this problem. - Yellow colour: Adjusts white colour playing potentiometers VR1 and VR2. - False contacts: Change power connector with a new one. - Interference: Checked all electrolytic capacitors. C50 is damaged. C44 is changed because is some ripple in +12VA of LM1889. It doesn't solve the problem. Finally I discover that all electrolytic capacitors near of 7805 (C27,C46) fail when 7805 warm up. Diode D11 is also changed. Spectrum run very well. - No power. The problem was the 7805 that was damaged. - Don't start, no -5V.Changed TR4 ZTX650 is changed by a ZTX651. - No sound. was fine but the diode D9 was broken. Changed 1N4148. 10/11/10 New fault: Spectrum issue 3B expanded to 48K with 4532-15 chips. This Spectrum had a previous failure and many 4116 chips were changed. It resets constantly and changes from white border and black paper to white screen and black dots. - IC24 chip 74LS00 broken. - 180pf C64 capacitor for a new 100pF(because the upper ram is 150 ns). - New C25 capacitor (improve image quality). JZX user discover the "unknown" CI7 chips of Centronics-128 MHT. New Interface: Transtape 1-2 Interface made by Hard Micro. Other version of the Transtape 3 interface made by Hard Micro. Centronics interface made by PIN Soft. 09/05/10 New interface: Other version of the Interface Centronics-RS232 Indescomp. Thanks to José Manuel. 14/03/10 New fault: spectrum 48k issue 3 that after TR4 changing (there weren't -5v & +12v) It started well but It didn't work properly ( but it passed some tests without problems). It hung / reset when It loaded games and also with some external interfaces. I check ULA (OK),Z-80 (OK) ,ROM (OK) y TR6 (OK). This spectrum is an 16K upgraded to 48K. In the service manual said that IC25,IC26 can't be National Semiconducter chips but this spectrum had National chips. The solution was to change both 74LS157. 13/02/10 New fault: Spectrum 48K issue 4S with white border and black paper with dot vertical lines.Lower memory fault. 30/01/10 Update the file about MIDI Ventamatic with the box's interface photos . 15/09/09 Update the file about MIDI Ventamatic with the instructions of the interface. Thank to José Manuel y Javier Vispe. Swift Disc interface made by Sixword (UK). Swift Disc 2 interface made by Sixword (UK). 5/08/09 New Interface: CopiaSoft +3 JG Componentes (Portugal). Other interfaces Seccion. 15/05/09 New interface: Cartridge for Timex 2068 (II). Thank to Bruno Florindo. Other interfaces Seccion. 19/04/09 New interface: Joystick interface Ventamatic. Thanks to José Manuel. 12/04/09 New interface: NMI Aktivator. File available in Other interfaces Section. Amateur interface that handles the NMI signal. Thanks to José Manuel. 07/02/09 New interface: RGB interface Ferguson. Thanks to Bruno Florindo. File available in Other interfaces. 01/04/09 Update the file about Lápiz óptico Pin Soft with the instructions of this inteface. Thanks to bitmaniatico. 10/01/09 New interface: Timex Interface RS-232. Thanks to Bruno Florindo. File available in Other interfaces. 05/01/09 New interface: Interface Timex for FDD3000 . Thanks to José Manuel and Bruno Florindo. File available in Other interfaces. 06/10/08 Available the instructions for the Phoenix 3 ABACO. Thanks to Javier Medina Lorenzo. 01/06/08 New fault: Spectrum+48K with white border and black paper with vertical lines.Lower memory fault. New Photo: Spectrum +2A issue 4 board. 17/05/08 Available the instructions for the Sound&Joystick Interface.. Thanks to José Manuel. 15/05/08 Two new faults: a Spectrum +2A and a Spectrum +2B with RAM problem. Spectrum+48K issue 4S made in Korea. Spectrum 48K board issue 4S. 12/04/08 New interface Adaptador universal programable para joystick. . Other interfaces Section . It's an amateur interface. It was not possible to obtain the scheme because the primary chip had its number deleted. Other curious things of this interface were its box (a cassette box) and the coat of paint over the board. Thanks to " Z80user "
01/04/08 Julio Medina send a photo of the Interface joystick programable INDESCOMP without "deleted" chips. 19/03/08 Thanks to Jorge del Llano, now the manual for Programmable joystick interface INDESCOMP is available. I'm looking for the software of this interface. If you have it, please send it to me. 02/02/08 New Spectrum fault.Spectrum 48K started with normal screen but it had some cyan pixels. The message "1982 sinclair research" was corrupted. video RAM chip IC10 was broken. 02/02/08 New photo: Spectrum +2A issue 2 board Spectrum +3 model.This board was the Spectrum +3 board without disk components. 17/11/07 New interface: Two version of indescomp domestic controller. Thanks to José Manuel. 23/09/07 Two new faults. Spectrum 48K with a fault Z-80 and a Spectrum ZX81 with a very dark screen (ULA fault). Repair page. 06/05/07 New photos: Spectrum 16K/48K issue 1, Spectrum 16K/48K issue 2-6 and Spectrum +48K. 18/03/07 New photos: spectrum+2, board spectrum+2 issue 3, Spanish spectrum +128k and board spectrum+128K issue 2. Two new faults. Spectrum+128K with power supply problem and spectrum+2 with power supply problem and RAM problem. New interface: Joystick and mouse interface by Investronica-FM&As . 04/03/07 New photos: inves+ ( computer and board), spectrum+128K( English computer, boards 6K and 9G, TS2068 (computer and board) and TC2068 ( computer). All photos made by José Manuel Claros. 12/01/07 New sinclair QL Fault. At power on, Ql started with white screen ( normally it was ram fault). With minerva ROM the Ql showed RAM fault at chip two. 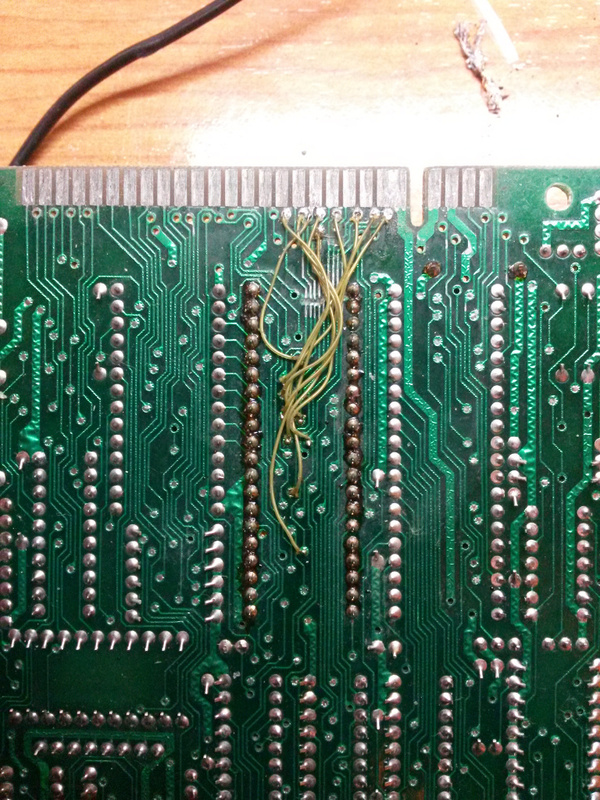 The ram chips were fine and the fault was the IC21 chip 74LS245. 24/09/06 New Spectrum fault found. Spectrum +48K started with black screen. Problem in -5V y -12V line. 25/06/06 I modify the letf menu. Now we can found the interface by mane or by manufacuter. 25/06/06 In the spanish version of this page, I put many pages about many interfaces that I found in spanish magazines and ebay. 15/05/06 First interface: Multiface 3 ( Spanish clone). It was lent for its study by Julio Medina. 15/06/06. Welcome to my page dedicated to hardware and Spectrum. This page born with the main propose to store information about Spanish interfaces. This information will appear in the menu "hardware". However I don't reject, in this project, to store information about foreign interface or other pieces of hardware related to the Spectrum.